Cheesy fries smothered in gravy—you really can't go wrong with poutine. Born in the province of Quebec and perfected in Montreal, Canada's most famous hangover cure is now being reinvented across town. 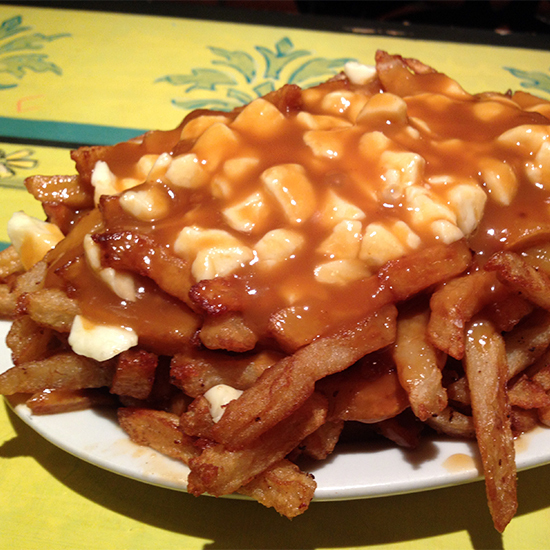 Here are three Montreal restaurants that are pushing the poutine envelop. “How has nobody thought of this before?” comes to mind when you try the Grilled Cheese à la Poutine ($6!) at this popular new bar with a vintage look and modern comfort food menu. A melty melange of cheddar, gouda, house-cut fries and sauce brune (similar to gravy) combine between buttered and grilled sourdough. The key swap at this renowned brunch spot is home fries. The chef tops a pile of them with hollandaise, caramelized onions, red and yellow peppers, cheese curds and an egg done any style. The end result ($12) is a perfect union of a.m. and p.m. comfort staples. Just like anything on the menu here, you can add pulled pork for $3. Speaking of porky poutine, this 24-hour, local-adored diner serves its version of poutine loaded with pulled pork, cole slaw and sour cream to create La Boogalou ($10.95). While La Boogalou is a favorite, La Reggae, (poutine with ground beef, guacamole, diced tomatoes and hot peppers) or La Miam, (ground beef, merguez sausage, onions, tomatoes and Swiss cheese) are also insanely delicious.